NEED A REALLY GREAT LOGO DEVELOPED? Did we mention Joe Jones is not only an accomplished illustrator and fine artist, but he's also an awarded graphic artist? This original logo graphic, and many other logo branding of Joe's has been showcased in nearly two dozen top manuals and design books on Adobe Illustrator and Photoshop over the past two decades as some of the best digital design in the business. 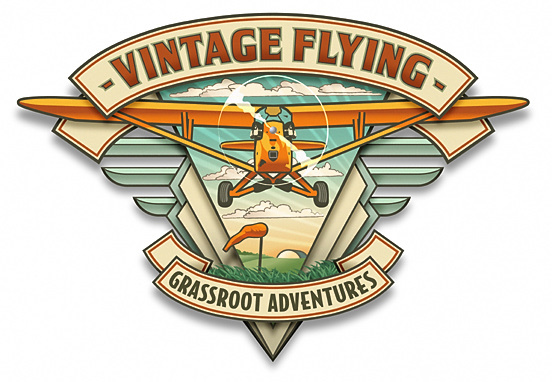 Today, we share this very special logo Jones created for a very special American aviator, Bern Heimos. Over the past twenty years, Bern has become a nationally famous Piper Cub pilot within the aviation community - known for his annual cross-county flight as he wonderfully documents each day of each flight just 500' (AGL) above ground level. Each year, Bern shares his stories and remarkable photos of his breathtaking experiences as he visits America The Beautiful at just 500' which is featured in the EAA publication, Sport Pilot. Please be sure to follow Bern's continuing flight, and see his latest photos as he is just now completing his journey - Heading to Brodhead, Wisconsin on September 4th.